Excellent digital full colour images providing a visual narrative accompanying the written word to better assist you with your build. 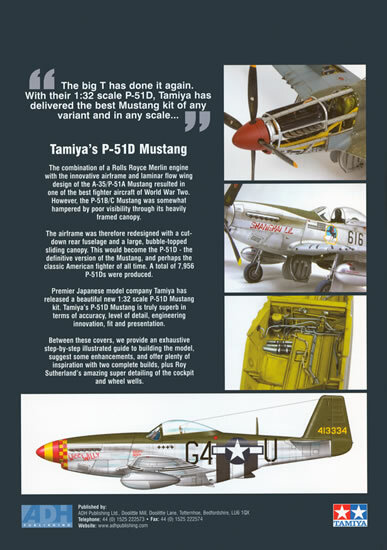 A well written, well illustrated and well presented book that you will not want to be without before you embark on the build of your Tamiya P-51D kit. If ever there was a kit that was much in demand it would have to be that of a definitive 1/32 scale North American Aviation P-51D Mustang. Following much rumour and speculation the Japanese Tamiya company satisfied that demand earlier this year with their state of the art kit, and what a beauty it is! Now I don’t know about you but it is with some trepidation that I approach this kit given its relative high cost and my fear that I will make a mess of the construction task as well as the painting decaling and weathering stages. Thankfully, ADH Publishing has come to the rescue here with their latest addition to their “How to Build" series of books. The book has been authored by none other than our esteemed and follicly challenged editor, Brett Green with contributions by Mark Glidden, Roy Sutherland, Richard Caruana and Charles Metz. The book is A-4 in size, soft bound with thin cardboard covers and comprises 78 pages of good quality heavy stock semi gloss paper (the same page count as the recent ADH Publishing’s How to model the Tamiya Mk VIII Spitfire book). 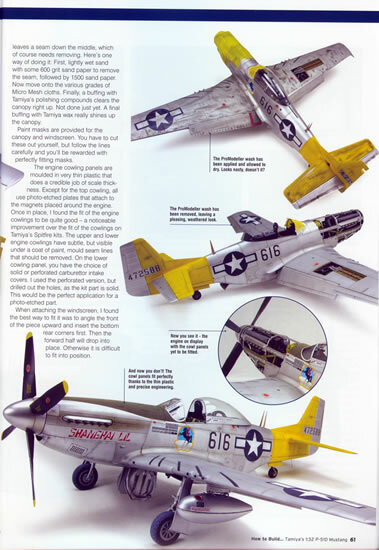 After the obligatory foreword you are treated to an introduction that provides a thumbnail sketch of how the P-51 came to be and of its evolution through to the –D and -K series. 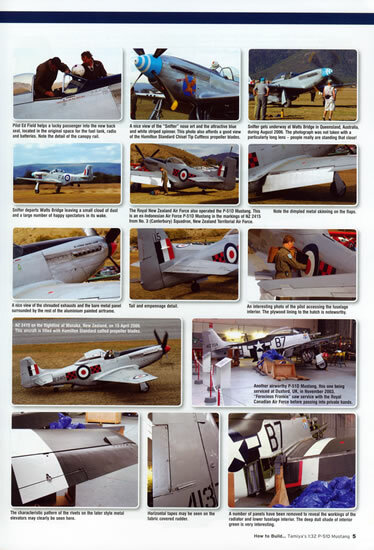 The introduction also includes some first rate full colour digital images of preserved P-51Ds, Ks and an Australian built Commonwealth Aircraft Corporation (CAC) CA-18 Mustang Mk 21. 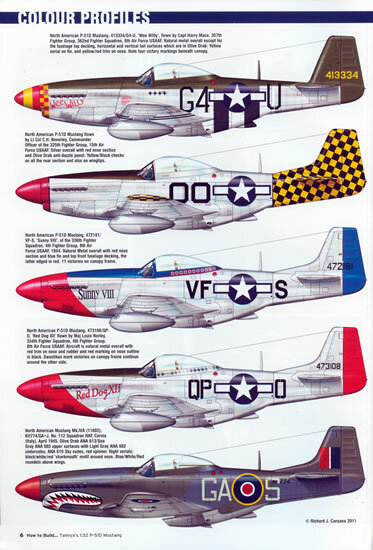 Following this there is a two page spread of colour profile drawings by Richard Caruana that depict 10 machines in the markings of the various countries that operated the P-51D. Unfortunately, there are no profiles depicting RAAF machines – shame Mr Green, shame! 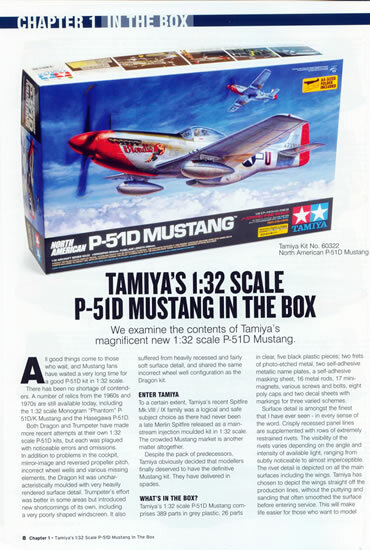 Chapter One Tamiya’s 1:32 Scale P-51D Mustang in the Box. 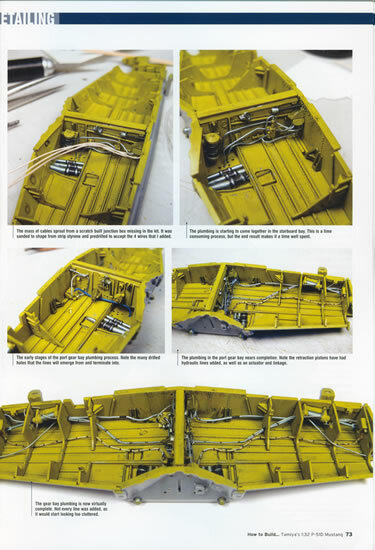 A four page comprehensive look at what is in Tamiya’s box, written by Brett Green. 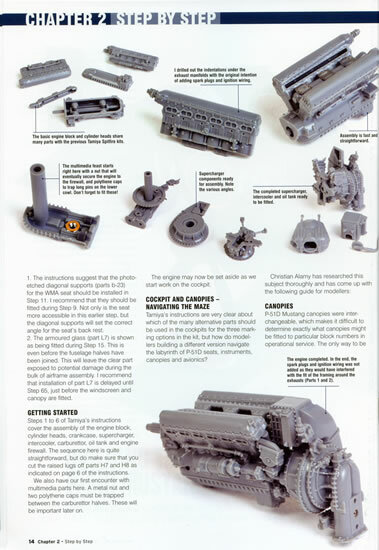 It includes a run-down on the parts, as well as the optional pieces and features excellent images of the various sprues, decal sheets and the canopy masks. Chapter Two Building 1:32 Scale P-51D Mustang Step by Step. Written by Brett Green, this chapter comprises 22 pages. 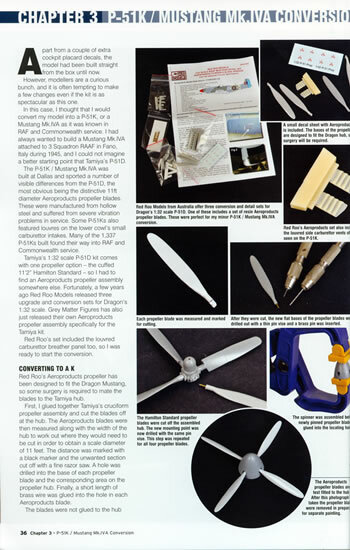 It is a written and pictorial essay on how Brett went about building his copy of the kit. The chapter includes hints and tips for not only building the kit but also tips to enhance the end result. Brett uses Airscale’s 1/32 Scale Generic Cockpit Placard decals to supplement the kit supplied decals too. 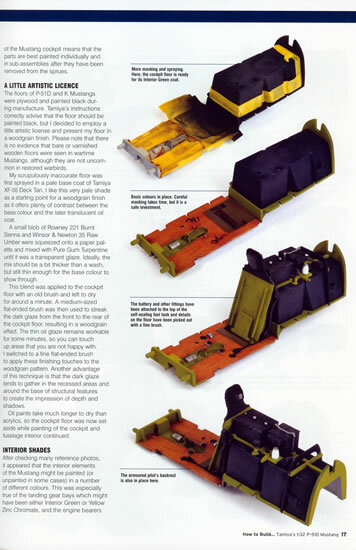 The chapter also includes a full page callout box on page 30 that deals with the issue of the puttying of the wings during manufacture by North American Aircraft. Written by Brett Green, this chapter describes how he went about making some minor changes to the kit by using the Red Roo Models conversion set to depict a P-51K/Mustang Mk IVA operated by 3 Squadron Royal Australian Air Force. 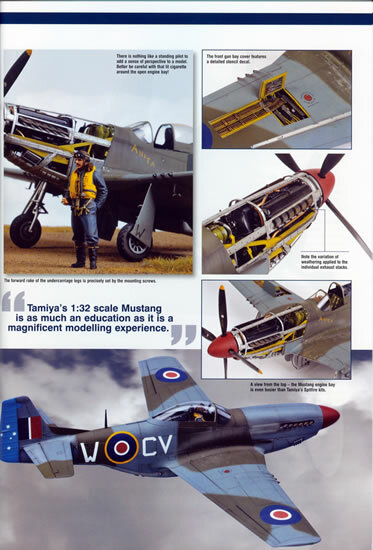 The chapter includes a callout box titled Everything You Wanted to Know about Australian and New Zealand Mustangs that advises you on the Red Roo Models book Southern Cross Mustangs which itself is a treasure trove of information on the P-51D/K as well as the Australian built CAC Mustangs. 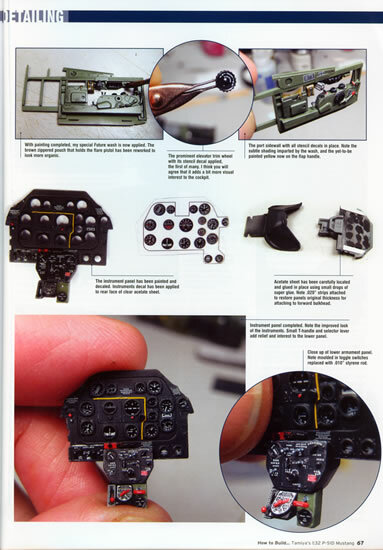 Again, the chapter not only describes how he went about the conversion but also the methods he used to enhance the build of the model as well as the painting of a pair of Master Details 1/32 scale pilot figures. Chapter 4 P-51D Very Long Range Mustang Conversion. 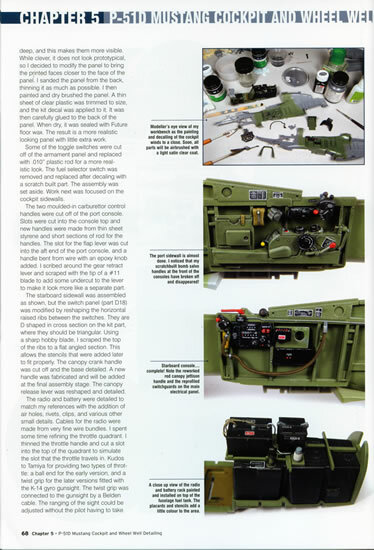 By Mark Glidden, this is a 15 page chapter that relates on how Mark Glidden went about building a Pacific Theatre natural metal finish machine. 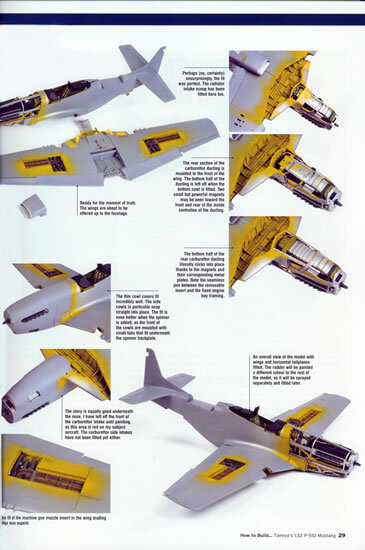 This is another modeller’s view of how to build the Tamiya kit and how to modify it to depict a late war Mustang fitted with the radio homing “Uncle Dog” twin antennas and the fin mounted AN/APS-13 tail warning radar. Chapter 5 P-51D Mustang Cockpit and Wheel Well Detailing. This twelve page chapter is written by Roy Sutherland. 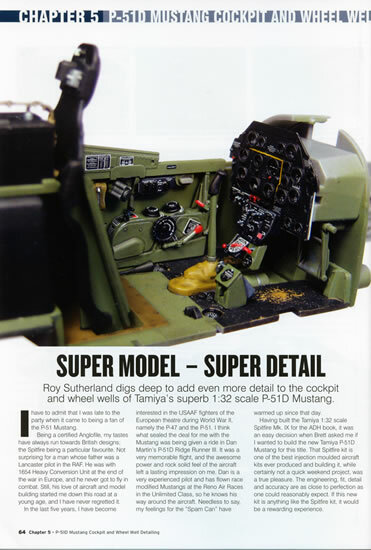 It describes how the detail obsessed Mr Sutherland went about building and adding even more detail to the kit’s cockpit and wheel wells, details that may readily be incorporated to enhance the already well detailed kit cockpit and wheel wells. 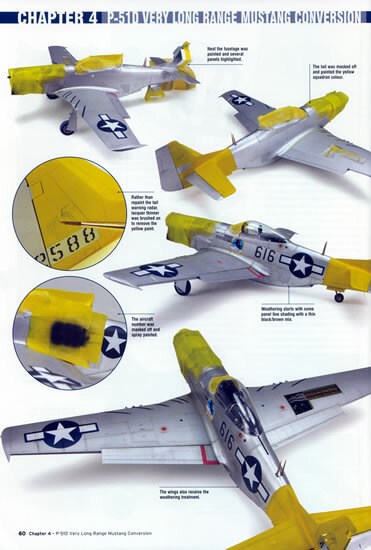 Appendix 1 – Accessories and Decals for Tamiya’s 1:32 Scale P-51D Mustang. A two page ready reference for available after-market resin, etched metal enhancements as well as decals, all listed by maker. Appendix 2 – Selected P-51D References. A real strength of the book is the excellent digital full colour images. The book is profusely illustrated with them throughout each chapter providing a visual narrative accompanying the written word to better assist you with your build. They have crammed a lot into the book’s 78 pages! 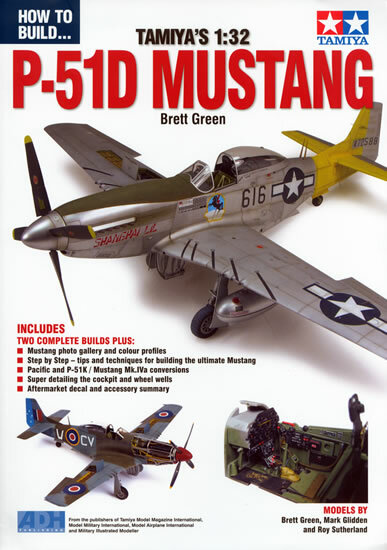 In summary, a well written, well illustrated and well presented book that you will not want to be without before you embark on the build of your Tamiya P-51D kit. Order online now from ADH Publishing.